The Nestucca River lives in Oregon fishing lore as one of the best there is. Big and pletiful runs of hatchery and native steelhead make this river one of my “go to” rivers during the winter months. Winter Steelhead make their way in on the heels of the Fall Chinook runs starting in December. Numbers build as the winter goes on and big time fishing can be found clear into April. Fish typically run 5-20 pounds, with many of the 20+ pound steelhead on the North Coast coming from this jewel annually. The Nestucca River holds it’s water very well and long after other rivers in the area are too low for good fishing, the Nestucca continues to shine. The river is what a steelhead river should look and act like with plenty of habitat for huge steelhead run production. The Nestucca is located just 20 miles south of Tillamook so this river, depending on water levels, gets a regular visit from me and my clients as I often fish both the Wilson River and Nestucca during the same day. My primary method of fishing for Steelhead is by way of side drifting. Side drifting is a “hands on” approach to Steelhead fishing that will have a client casting for and hooking their own fish. Many are familiar with the technique, but if it sounds like a bit much for your fishing abilities, don’t worry, everyone has had to learn at one point or the other and I’m happy to teach. It’s fun, interactive and in the end, my clients really enjoy the “hands on” aspect of the technique. Should physical limitations make casting too much of a chore for it to be enjoyed, I’m happy to shift gears and make it an enjoyable day with a technique that is quite effective, but not as demanding. Plug pulling is a favorite among many of my elderly clients and clients with small children. It’s a technique that’s been around forever and accounts for some great days. Many of my clients come in the night before and some fish for several days at a time. If this is to your liking, many of my clients choose to stay at the Garibaldi House. Breakfast in the morning and a great boat lunch if you’d like it, makes the Garibaldi House a great place to stay for fishermen. As mentioned earlier, I regularly fish with Wilson River for Winter Steelhead as well. 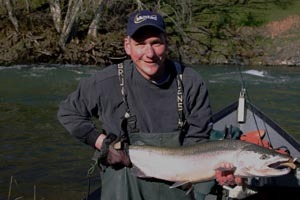 For more on that river, visit my Wilson River Steelhead Fishing page.